So long as Northern Irish medals remain in the UK forum section, I'll vote aye too. Joking aside, I would make it a forum section for all medals and miltiaria with a connection to Ireland or to the Irish fighting overseas (since there were a few of those over the years). Can any of the Moderators opine on this ???? Great humour Ulsterman! nice to have a bit of lighthearted banter. ... but, I wasn't completely kidding....creeping annexation, even in chat rooms, hrummmph! I too, support the proposal for a new Ireland forum! oh oh me too!! id love an irish forum!!!! iv even got a few bits and pieces to show to!!!! Just a quick question with regards All Casualties from the War of Independence is there a comprehensive official list and if so where would it be kept? And is it accesable for research?. There is a list....but not accessable publicly. Myself and Irish1916 are currently involved in a study and one of the items is casualty and postumous medals. Dealing with the Irish Defence Forces is, as you maybe aware a long drawn out process and it takes ages to get details out of them. Fingers crossed we will have more information in the coming months. Any update on an 'Irish' forum ????????? Good luck in you endeavours Irish1916 and Irishmedals. I made an application relating to a file containing information on my grandfather's involvement in the War of Independence. At present I am the external review stage after making a request to see the file under the Freedom of Information Act, if permission to see the file is refused under this review the only other option is the High Court. I first made the application to see the file in January 2007, over 1 year and 2 months ago. After the internal review of my request to see the file I was told files are only available to the individual named on the file or his direct descendants, applications must be made with proof of relationship. As I am sure you already know the military archive is only accessible by appointment and as far as the two archivists are concerned the stuff in the archive belongs to them and you have no right to see it. I did attempt, on several visits to the archive, to find a list of the named 1916 medals but the file index system is so bad I am not surprised it takes so long to locate a file. I also attempted to see the original 1916 Roll presented to Dev by the 1916 Veterans Association in 1936 and although both the National Museum (Collins Barracks) and the Military Archive are aware of its existence they were unable to locate it. The 1936 Roll was used to update the 1966 Roll and I was curious to see which names appeared on the 1966 Roll that did not appear on the 1936 Roll. Regret to advise that a request was turned down. Actually, despite my visceral political views on this subject, I was hoping there would be a "separate" (partitioned?) Irish forum. There certainly is more to the subject than I realized and the leading lights in cyberspace seem to congregate here. It would be useful to have them all under one rubric. Was any explanation of grounds provided with the refusal? From the annals of the strangest - a 1916 Sleeper Medal ???? or whatever........., certainly takes the prize for flowery provenance ! Reportedly sold for Euro 9,800 + 15% hammer. I can only assume that they know the location of the other three. The couch may offer a clue. Any fellow traveller among us with further information ? "A very rare Easter 1916 Sleeper s Medal made by Hopkins & Hopkins Jewellers Dublin Assay 1934 9ct Gold. Presented to Thomas McMahon William St Nenagh for Special Favours . (1? diameter).Guide - ?5 000-10 000. Reputed to be one of only four one of which has never before been seen at auction. This medal was the property of Thomas McMahon Nenagh Co. Tipperary who died in 1985 and who passed the medal along with a pocket watch to his nephew with the words Mind this shortly before he died. It is 9ct Gold assay mark 1934 and made by Hopkins & Hopkins of Dublin (a famous Dublin Jewellers who also made the Sam Maguire Cup). Thomas McMahon was a very good friend of Eamon de Valera with whom he regularly met in The Carmel Hotel when de Valera passed through the town. In fact when the hotel was being refurbished in later years the couch they used to sit on was passed to Tommy and it remained in his house until his death. (Thomas McMahon is referenced in the book These Chains by Ger Lewis). Thomas McMahon was a scholar and responsible for bringing the first Trade Union to Nenagh. What part he played in 1916 remains unclear. He never spoke of it. After his death the medal was shown to a surviving Republican Veteran who was very shocked upon seeing the medal. He held it in his hand and stroked it. He knew what it was for he knew it had been given out but had never seen one. He would only say it was a Sleeper s medal given for special favours and was one of only four. For weeks afterwards this elderly man would walk 3 miles to the house to see the medal again." 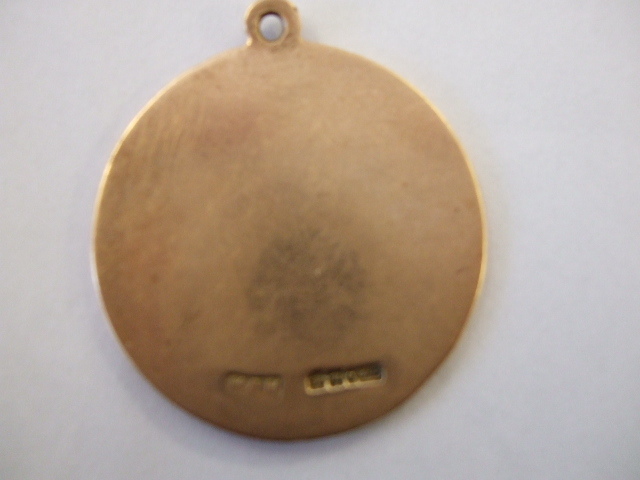 I was contacted by this auction house when they first received this medal requesting help in identifying it. At first the seller had a 1922 date (and my hopes were raised for a link to the very rare Collin medal) but this was then confirmed as 1934 (the s & g with the font used were easy to mix up apparently). The "surviving Republican Veteran" memories of the medal included its rareness (I was told 2 in total) but his reluctance/unwillingness/inability to add any more detail was worrisome. I found this a romantic but potentially misleading selective memory. Needless to say I found no collaborating evidence and was thus not the eventual purchaser. Any details would be gratefully appreciated to help get to grips with this item. Certainly an interesting story although it would appear a bit unusual for a 'sleeper' to receive his medal in 1934 and everyone else who took part in the 1916 Rising had to wait until 1941 to receive theirs. Also the inscription on the medal 'At Easter 1916' suggests a commemorative medal. 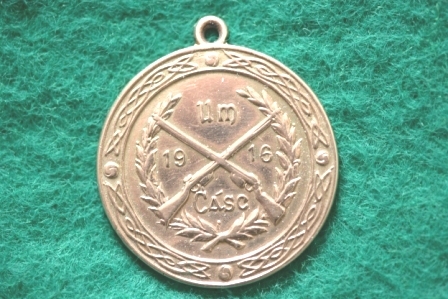 An idea what was on the back of the medal? This is all i had showing the back, the stamps are as mentioned earlier. Indeed! Mind you, my Anglo-Irish great-aunt Emma by marriage remembered the Easter Rising as an eleven year old girl, and being sent down to Bolands with her bicycle to fetch some bread after it was occupied. They gave her some too! Anyway, she told me of a hilarious letter her mother had received from two dotty old maiden aunts from somewhere in the Cotswolds, who had decided to visit Dublin on a whim for the Easter weekend. They found it a boring, empty place, with most shops shut, people "looking shifty", and some sort of military exercise going on, that prevented them from paying a visit to Emma's family. They were not at all impressed with the city nor with the staff at the Shelbourne Hotel, who refused to take messages to people the two old biddies wished to visit. So they went back to Kingstown, as Dun Laoghaire was called in those days, as the boat train wasn't even running, which irritated them even more, and went back home to England. The letter is somewhere in the files of that branch of the family. I would love to see it. I tend to agree that this "Sleeper Medal" is a bit of a tall tale. The medal doesn't even look like anything the Irish government would have presented. It looks like some sort of generic sports or competition medal. Speaking of the 1941 awards and the evident feeling on the part of some Irish members of being snubbed over a dedicated Ireland forum, I think I put a couple of noses out of joint on another forum when members raised objections to discussions of IRA medals because they had nothing at all to do with British medals or medal groups. I pointed out that more than a few Irish veterans of HM Forces received medals for the Anglo-Irish and Civil Wars, as well as the 1939-1945 Emergency, and that, in any case, these medals were issued by the Free State government, making them Commonwealth or, in fact, Dominion and therefore British Empire issues. The discussions were deleted nonetheless. LOL! Any fellow Irishmen care to comment on my point here? My thoughts are also that it is a commemorative medal with no real historical significance. The posting of 'bawn' has a certain air of probability to it. If it had belonged to someone who took an active role in the planning and execution of the Easter Rising then it might be worth the price of ?9,800 + fees. That was alot to pay for an unknown and unresearched item with no evidence of provenance. Had it been a medal for 'special favours' then i believe it would have been inscribed to the recipient from whoever acquired it and maybe for why it was given. A 'sleeper' ??? never heard of those before. I really hope that one day the full story is known about it, but for now i feel the story behind it is very sweet and perhaps tugs at the heart strings. As all the medals issued by the Irish government were issued in or after 1941 they would have been issued by the Government of Ireland, the 1937 constitution changed the name of the country from The Irish Free State to Ireland, and as the 1937 Constitution also removed the Pledge of Allegiance to the British Crown I think that put an end to Dominion Status also. I do not know what the rules are regarding one Commonwealth Country wearing military medals awarded by another Commonwealth Country. If you had a WW1 veteran who fought in the Irish War of Independence and then received an Emergency medal you could say he fought on both sides and none. My uncle served in both the Irish and British Navy, he was in the Irish Navy from 1938 to 1942 and then joined the Royal Navy where he served for 12 years. He settled in London after leaving the Navy and on joining he local British Legion club was told under no circumstance could he add his Irish Emergency medal to his WW2 group and it would be best no to mention his former service with the Irish Navy, this happened back in the 1950s so I am not suggesting it is the same now. Thanks, Brendan. I always thought the Republic, as such, didn't come into being until 1949 and that ireland remained a Commonwealth member until that point. That clarifies things for me. There could be a problem with the named/numbered 1921 Service Medal currently on Ebay. The medal awarded to a recipient of that name has a different number in the research information available to me. I have asked the seller to post an image of the medal reverse and have also asked that he confirm the number stated - alas to no avail. although i cant add anything to the descusion about the medal itself i can say my grandad(who sadly died 2 years ago) was 7 at the time of the easter rising and was on dollymount strand when it all kicked off and remembers the trams coming out of the city all shot up! actully later on during ww2 he worked for the goverment billiating(?) irish troops around ireland and help design and place the only german war graves site in ireland! was intresting to find that out! !